Enjoy high-quality photos and 4K Ultra HD video @ 30Hz (3840 x 2160) and utilize the full graphics performance of your MacBook, iMac or other USB-C or Thunderbolt 3 computer. 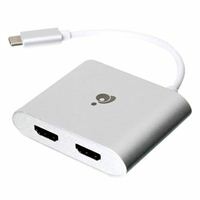 Listen to High Definition audio through the HDMI connection as you watch movies or videos.The adapter's durable aluminum alloy housing and its portable compact size make it the ideal laptop companion. Whether you're in the office or on-the-go, you can quickly connect to any HDMI TV, monitor or projector for superior images rivaling desktop graphics workstations.